I have the permission from the author, for those who want to know. As long as I do not get any profit from his work (I’m assuming that I can’t sell his work) I can keep translating. 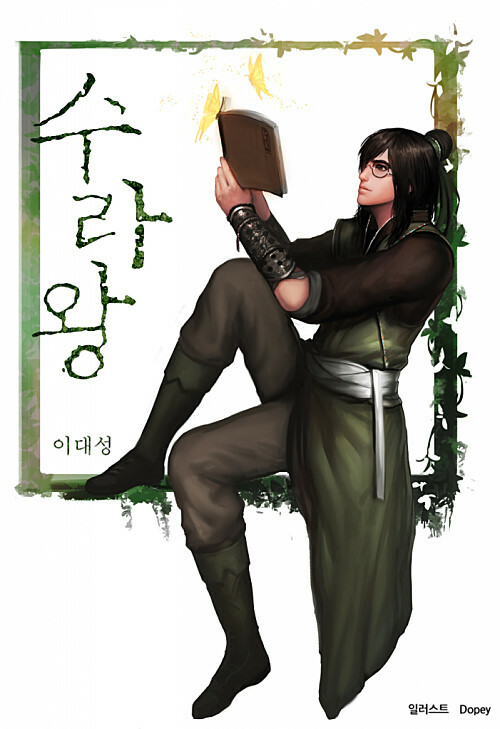 Lee Dae Sung created two web novels, one is King Shura, and the other is called Sajawang, or The King of The Dead (rough TL). King Shura ended at chapter 307. The King of The Dead, however, is ongoing at chapter 30+. Will definitely take it up as a project in the future, since it’s funny as hell (to me). Here’s his blog, you probably can’t read it, but it might be good to check it out. Ensj how do I contact you? Just curious, but you do not have illustrator listed. Did the author do the artwork too? I like them a lot, and they fit the feel of the story perfectly, which is really rare if you ask me. Thanks for the answer anyway. Maybe we’ll find out someday. Ah… The guy’s called animato, apparently. I wonder why I just found out about that? I don’t know the guy who drew for the first.. 30? 40? chapters though. Not the same? I’ll have to read from the beginning and look at the pictures again. No hardship there, I love this series thank you for the introduction. Looking forward to the prequel (I guess) that you teased me with before. Hey Ensj just throwing this out there but would you be willing to translate Dawn Traveler? its a really awesome novel my the author of LMS and was being translated by koong koong a long time ago but then he made the site private for some reason, I’ve been patiently waiting and hoping for him/her to come back but its been so long and I dont think he/she will be continuing. I know that before he stopped he had got in contact with the author and they allowed the translation of the pay to read chapters as long as he/she agreed to take the translated chapters down as soon as the novel got serialised and translated to english professionally so I dont think you would have a problem with getting permission. Sorry for asking here but I dont know how else I could contact you to ask and I really want someone to pick up the translation of Dawn traveler its really awesome and has a lot of potential to be more awesome than even LMS! please just consider picking it up please! Thank you for your time please reply to let me know your decision. I understand, just had to ask cause I really enjoyed Dawn Traveler. Keep up the good work anyway! IKR! don’t need to tell me! if it wasn’t I would have just moved on with my life long ago instead of trying to push it on other translators that already have projects doing. I swear if I wasn’t a broke college student I would pay someone to translate it… sigh…. maybe after I finish college and get a job. Yes. I found you own site.. So much better. Hopefully comments work here. So far I have spent hours trying to get a comment to work on novelsnao. So yea.. that would be about 15 comments that have vanished in thin air due to their horrible system. Why make a website when you have no idea how to properly handle one I wonder. This site is so much better.. simple and working as intended. Anyway the bulk of my comments was just to express my gratitude for your work and notifying you of the comments being bugged on novelsnao, usually not posting even if you have an account on the site. So once again, thanks a lot and know that you have a dedicated reader. mail me at ensjtrans@gmail.com. I’ll give you links to the raw folder. Hello, i wish to read the raws too…can u please mail it to me too? Again, just mail it and I’ll send it. Nope, I just went to India for a week, and decided to delay it for a week. king shura hasn’t updated for a while, is it dropped?